By the time he was twenty-seven years old, Kwame Onwuachi had opened—and closed—one of the most talked about restaurants in America. He had launched his own catering company with twenty thousand dollars that he made from selling candy on the subway, yet he’d been told he would never make it on television because his cooking wasn’t “Southern” enough. In this inspiring memoir about the intersection of race, fame, and food, he shares the remarkable story of his culinary coming-of-age. Growing up in the Bronx, as a boy Onwuachi was sent to rural Nigeria by his mother to “learn respect.” However, the hard-won knowledge gained in Africa was not enough to keep him from the temptation and easy money of the streets when he returned home. But through food, he broke out of a dangerous downward spiral, embarking on a new beginning at the bottom of the culinary food chain as a chef on board a Deepwater Horizon cleanup ship, before going on to train in the kitchens of some of the most acclaimed restaurants in the country and appearing as a contestant on Top Chef. Onwuachi’s love of food and cooking remained a constant throughout, even when he found the road to success riddled with potholes. As a young chef, he was forced to grapple with just how unwelcoming the world of fine dining can be for people of color, and his first restaurant, the culmination of years of planning, shuttered just months after opening. 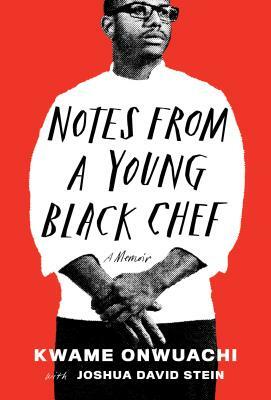 A powerful, heartfelt, and shockingly honest story of chasing your dreams—even when they don’t turn out as you expected—Notes from a Young Black Chef is one man’s pursuit of his passions, despite the odds. KWAME ONWUACHI is the executive chef at Kith and Kin and owner of the Philly Wing Fry franchise in Washington, D.C. He was born on Long Island and raised in New York City, Nigeria, and Louisiana. Onwuachi was first exposed to cooking by his mother, in the family’s modest Bronx apartment, and he took that spark of passion and turned it into a career. From toiling in the bowels of oil cleanup ships to working at some of the best restaurants in the world, he has seen and lived his fair share of diversity. Onwuachi trained at the Culinary Institute of America and has opened five restaurants before turning thirty. A former Top Chef contestant, he has been named a 30 Under 30 honoree by both Zagat and Forbes. In this bravura follow-up to the Pulitzer Prize, and National Book Award-winning #1 New York Times bestseller The Underground Railroad, Colson Whitehead brilliantly dramatizes another strand of American history through the story of two boys sentenced to a hellish reform school in Jim Crow-era Florida.